In April 2004, the ICEB General Assembly declared Unified English Braille to be substantially complete and that it could be recognized as an international standard and considered for adoption by individual countries. The original UEBC Research Project and its subcommittees were accordingly disbanded and replaced by a new project charged with oversight over UEB, including its further development. For current information, see UEB Project Information. This "Research Project" page, and the documents listed herein, reflect the state of the Research Project just prior to the termination of that original development phase, that is as of March 2004, and are being maintained for background information and also as a resource pending the development of definitive manuals and related documents. Details given herein may have changed at the time the project entered its new phase, or since. In particular, please note that the working committees listed here are no longer active, though their archives may still be accessed. A Note on "UBC" and "UEBC"/"UEB"
Since the ICEB General Assembly in 1999, it has been customary to include the word "English" in the formal project name and correspondingly an "E" in the abbreviation. However, prior to that time, they were not included because English context was assumed. Accordingly, "UBC" is the norm in older documents, including parts of this web site, and is still common in informal usage. The project comprises a UEBC Project Committee and several working committees; see the section entitled "Working Committees", below, for more information on the latter. It is important to understand that UEBC is not presently an official transcription code in any jurisdiction, but remains a research project. Besides the inherently very difficult nature of the design work, there is opposition from persons who do not accept the feasibility or desirability of unification, or who wish the unification to take some other form, all of which must be properly considered. For these reasons, it is not possible to estimate an acceptance date for UEBC. If and when a complete UEBC is accepted by the ICEB, it will still be up to the various national authorities to adopt UEBC for official use in their respective jurisdictions. For further information about the UEBC, see the documents below or e-mail the UEBC Project Chair, Darleen Bogart of Canada, at darleen.bogart@cnib.ca. It is possible to become a participant in the project by observing on one or more working committees, which conduct their business primarily through e-mail servers. See the section entitled "working Committees" below. The paper that convinced BANA to begin work on UEBC was a memo by Drs. Tim Cranmer and Abraham Nemeth, written in January 1991. A transcript of the "Second Debate on Numbers" details the process by which Committee II reached the decision to use the traditional "upper" representation for numbers. The October 1999 Supplementary Report of Committee II amends and extends the March 1995 report. The Report of the Joint Session of Committees II and IV (February 2001) further extends the March 1995 report to include switching symbols for non-UEBC codes used within UEBC. The UEBC Symbols List shows all grade 1, numeric and assigned shape symbols for UEBC through the February 2001 report of the Joint Session of Committees II and IV. The Reader Rules is the January 2004 Report of Committee 2 and supersedes previous reports on the work of that committee. The Committee 2 Current Working Symbols List is a list of symbols reflecting the current internal working status of Committee 2. The procedure by which the UEBC committees conduct parliamentary e-mail deliberations (an adaptation of the well-known Robert's Rules of Order) is detailed in memo js6620a to Committee II , updating a similar memo of July, 1993. The Journal of Visual Impairment and Blindness (JVIB) February 2004 "Perspectives" Column provides views pro and con on the subject of UEBC. Each of these is a short paper that concentrates on the issues surrounding some single aspect of UEBC, explaining the UEBC point of view in a dialogue format. If, when viewing the monographs as Web pages, you wish to see the braille examples and symbols in simulated braille form (dots) and they do not appear that way, see the separate UBC Symbols List for information on settings and/or fonts that may be required. The downloadable standard ZIP archives each contain two braille files -- "formatted braille" (.brf) already set up for pages 25 lines deep and 38 cells wide, and a Duxbury ".dxb" file that can be used to produce some other size if required. (See UEBC Samples for more information on the .dxb format.) The file names follow that of the .zip; for example, monbas.zip contains monbas.brf and monbas.dxb. See the BANA UEBC Sampler Series for an extensive series of examples transcribed in UEBC. See also UEBC Samples for miscellaneous examples transcribed in UEBC. Finally, further examples can be found in some of the papers listed in the previous section, and also within the working committee debating records (see the "UEBC Working Committee Archives" section below). Please see important general information on Interpretation of Working Committee Archives. Archives for deliberations since August 12, 2002 are maintained in association with the lists at http://www.freelists.org. bman.zip (bman98.txt): the RNIB Braillist's Manual (1998) (for British Braille), in plain text form. bman1brf.zip (bman1.brf): the RNIB Braillist's Manual (1998) (for British Braille), as a formatted-braille file, volume 1.
bman2brf.zip (bman2.brf): the RNIB Braillist's Manual (1998) (for British Braille), as a formatted-braille file, volume 2.
http://www.brl.org/formats/: the BANA Braille Formats manual (1997). britbrl.zip (britbrl.txt): the current British Braille manual, in plain text form. bbbrf.zip (bbrl.brf): the current British Braille manual, as a formatted-braille file. bbnewwp6.zip (bbnew.wpd): the British Braille manual new edition draft, as a WordPerfect 6+ file. The submitter notes "that the files relating to the new edition of British Braille contain a working draft, and have not been fully corrected or ratified. However, these are a better indication of current thinking than the older published version of this codebook." bmn.zip (bmn.brf): the British mathematics code full manual, as a formatted-braille file. bbmnbrf.zip (bbmn.brf): the British mathematics code basic manual, as a formatted-braille file. 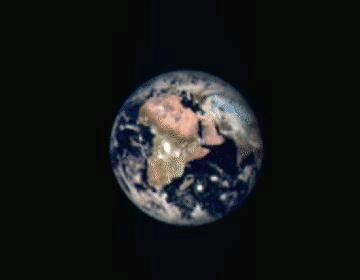 The image of the earth at the top of this page was taken from the Clementine spacecraft. A more extensive collection of Clementine images of the Earth can be found at the Naval Research Laboratory's Center for Computational Science. For related NASA images, see the NSSDC Photo Gallery: Earth and the NASA Photo Gallery.